After a long delay due to high workload over xmas sales and having to move house (again), the telescope goto mount progresses. 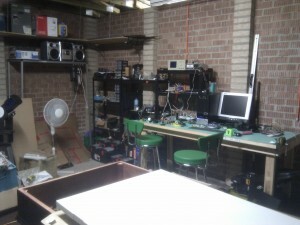 The man-cave is now mostly setup as a workshop and various projects begin once again. Programming the PIC Micro goes into gear with the motors now controlled by an interrupt service routine. The timer is on about a 5ms tick. each tick it tests the speed setting of each of the 3 motors. If the motor is within 10 degrees of the aim the speed is set to slow by the main routine else it’s fast. The ISR will either tick the motor over every interrupt on fast, or every 4 ticks on slow. Perhaps a tad rough but its a start and it works 🙂 (well after much debugging and swearing as usual ). With only 5ms per tick I needed to keep the ISR code as simple as possible, my first attempt had it too slow and there wasn’t enough time for the LCD code in the main routine to work!!! Also I found the motors turn much smoother and stable with the ISR control. Though I’m not convinced the steppers I chose will be strong enough for the end design but at least they are easy to swap over. For those of you who may be interested in the code just let me know in the comments, if needed I’ll clean it up and post it. So onward to sleep 🙂 back again soon I hope!